Exhibition: "Entangled: Two Views on Contemporary Canadian Painting"
Having reduced my palette to black and white in 2012, I am trying, since 2015, to include ambient light in my work, by painting on clear acrylic supports (commonly known as plexiglass), using this material’s transparency, reflective properties, reversibility and plasticity. By adding light to the traditional aspects of abstract painting, I seek to create a visual complexity that speaks of our time in which the screen is everywhere. In this new project, I tried to reintroduce colour in my work, by ways of the support. 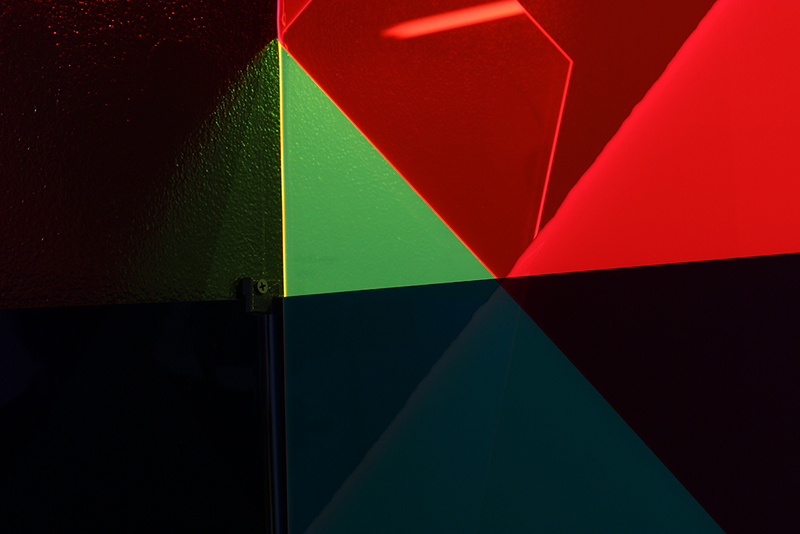 I was seduced by primary coloured fluorescent plexiglass that throws light on its edges. The challenge was to create a fascination for colour and light that would be mainly pictorial with this material heavily associated with design. Thus, I used the plexiglass as if it was the paint: paying close attention to the specific effects occurring in the material. To make the most out of it, I have given up patterns to favour gradients that occur when a thick coat of acrylic paint gets thinner and let the colour of the panel appear. These gradients alter the colours, make the panels opaque and reduce the quantity of light that gets through them. I created 3D paintings that hang to the wall but juts out into the room to catch surrounding light. Contrasting coloured panels overlap, creating new colours, light effects, and veils. The wall itself, painted black under some paintings, changes their hue and enhance this layering. Reversible, the paintings look contradictory when seen from different sides. However, one can easily mentally deconstruct their components, entirely exposed. This power of a painting to create an illusion, even when its material reality lay bare, is an important part of this project. Between transparency and opacity, illusion and objecthood, these paintings embody contradictions. All my gratitude to l’École des arts visuels et médiatiques and the Faculté des arts of UQAM, the Canada Council for the Arts and the Joe Plaskett Foundation for the financial support of this project. I would like to highlight the precious and tireless contribution of my skilful, intelligent and reliable studio assistant Éloïse Carrier. The technical support of David Allard Martin, Mario Baillargeon, Danny Glaude, Olivier Heaps-Drolet, Ianick Raymond and Jean Talbot were also essential to realizing this body of work. Each piece is created on a very thin sheet of Plexiglas painted on one side before being bent into three sections through thermoforming. Two sections are painted in flat black tints, giving them a mirror-like quality, or in white, which reflects light. The third section is clear and covered in a pattern of translucent dots that seem to break away from the surface, producing the illusion of movement and depth. The folding of the two panels on either side of the central one produces a complex interplay of reflections between the three sections, while the concave shape it creates captures light and multiplies the effect of transparency or distortion within the cluster of dots. 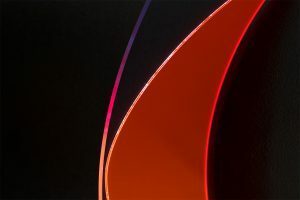 The choice of Plexiglas has deepened my research into the materiality of colour and light. The painting’s presentation in the gallery allows viewers to experience their near-sculptural nature as they extend into the exhibition space, and to witness how dramatically their appearance shifts depending on the angle of view. Interview with NSCAD University blog about my research residency there in the fall 2015. All my gratitude to the Joseph Plaskett Foundation, the Triangle Arts Association, NSCAD University and the Robert Pope Foundation, who supported the development of this new project. My warmest thanks to my skilful and reliable studio assistants, Katie Lesser and Arkadi Lavoie Lachapelle, as well as Donald Thompson, Martin Schop and Atelier Clark, who helped resolve many technical challenges. Choosing to paint exclusively in black and white represented a devious challenge: borrow a constraint from optical painters I admire while using opposite pictorial processes. Therefore, instead of deliberately painting colour patterns, I allowed matter itself to (de)form them. In my most recent project, I used thin flexible plexiglass panels. With my assistant’s help, I covered these supports with fresh paint and manipulated them in order to induce a displacement of liquid paint. The pattern of dots and trails that is generated by this process traces contradictory movements within the painting. Thanks to: Centre Clark (Montreal) and the wonderful team at Zébra3 (Bordeaux) for being so welcoming and supportive. Above all, special thanks to Amélie Boileux for her invaluable contribution to this project. This series of paintings was created using ivory black and titanium white pigments that were diluted with a great quantity of acrylic medium in order to make them translucent. Stimulated by the challenge arising from this constraint, I sought to let an intense visual depth emerge, beyond the simplicity of grayscale. The superposition of a fine coat of liquid color on black or white panels allows the emergence, through transparency, of very peculiar shades of black, brown and gray. 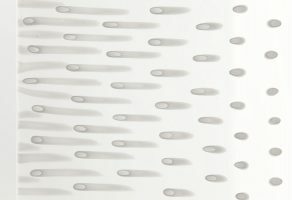 A dotted pattern with trails reflects the displacement of paint on a flexible support that was curved. The result is a corpus of works that is both simple and complex, optical and material, controlled and unpredictable. Thanks to: Darling Foundry and Astérides. These paintings were created using exclusively lampblack and titanium white pigments. The pure colors were simply diluted with a great quantity of gloss acrylic medium. 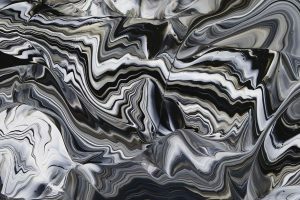 By varying their degree of transparency and opacity, I was surprised to see a wide array of grays, with hints of color ranging from blue to brown, appear. 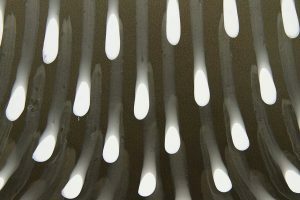 Every series was created using a dripping process, which induces a predictable yet unique pattern. 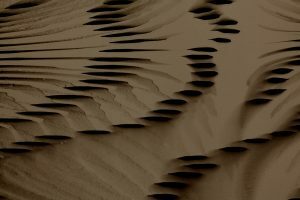 I used the various combinations of a color range limited to three shades of black and three shades of white, paying attention to the moments where a unified surface takes shape, while still hinting at the underlying layers below. Thanks to: Est-Nord-Est artist residency and Conseil des arts et des lettres du Québec. Photos: Éliane Excoffier and Martin Désilets. Two series of paintings coexist and mingle in the gallery space. The Ellipses en transit are painted drop by drop like the paintings from phase 1, but part of the circular support is left exposed. From one painting to the other, I varied the color order (YCM, CMY, MCY, and so on). The illusions of depth or torsion that appear in the painted ellipse are contradicted by the marked presence of the wooden support, creating a spatial tension. The Flaques are made from a superposition of CMY or CMYK paint drops, of which I altered the transparency. A hint of white paint is often added to the mixture, changing the color tone from light to dark and its materiality from transparent to translucent. 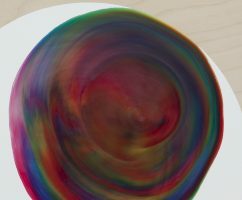 Publication: Bédard, Geneviève, Julie Trudel : Projet CMYK – phase 2, Optica, un centre d’art contemporain, 2012, Montreal. Thanks to the Canada Council for the Arts.